Private security is an industry which has been around for several hundred years. Even in Ancient Egypt, ruling pharaohs would hire personal security guards to guarantee their protection. Romans had security guards protecting their emperors, as did the rulers of the Byzantine Empire. 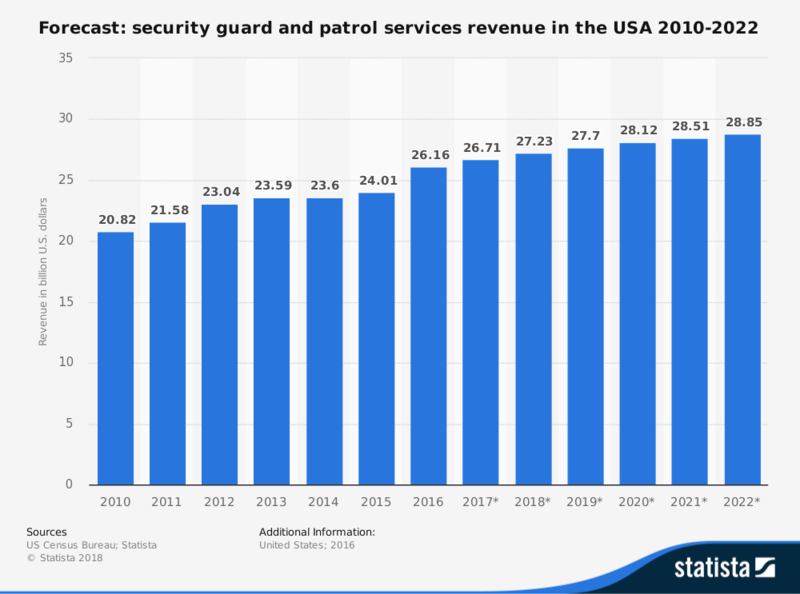 In the United States, the rise of the security guard industry coincided with the events of the Great Depression. Guards were hired to protect factories and private businesses, a need which increased during World War II. By the era of the Cold War and its threats of foreign espionage, the security industry in the U.S. continued to add employment opportunities. Security guards help to make people feel safe. With a constant threat of terrorism, both foreign and domestic, opportunities within this industry continued to increase. The primary challenge to the security guard industry today is automation and remote monitoring. As technology is able to proactively monitor property and people in more places and with additional reliability, the role of a security guard continues to be reduced. That has created a need within the industry to hire highly-qualified guards and administrative staff who know how to implement these technologies effectively. Although there are growth opportunities available in this industry, the increased demand is for guards who know how to implement modern high-tech dashboards, use CCTV resources to their benefit, and are highly trained in high-stress, potentially dangerous, encounters with individuals who may intend to do harm.